Last night I went to a local coffee shop’s open mike night on a complete whim. I expected to hear mumbling music, bad poetry, and caffeine induced performance art. Yes, such amateur excitement did deliver, but what I didn’t expect was for the evening to turn into a writing exercise. One after one, crazy characters kept walking through the door of the coffee house and I couldn’t help myself from jotting down a line or two about each eccentric person I saw. Before I knew it I was writing about half the people in the room. Thinking about character introductions and making your characters pop off the page, this struck me as a great exercise in painting a picture in only a few sentences. 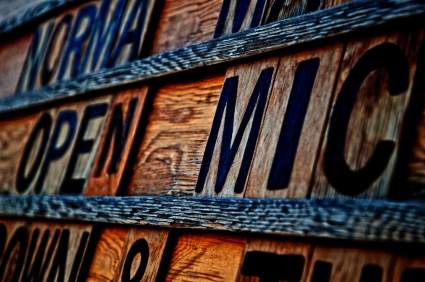 So I invite you all to go to your local open mike nights (or just hang out at a coffee shop) and write a line or two about all the amazing and individual people you see. A sixty-year-old Salvador Dali knockoff in his brown suit and black beret, stands to the side with harmonica and guitar ready. He’s been waiting all day for his five minutes of open mike madness. Later, when the crowds have dispersed I see him rooting through the flowerpots. He digs out a succulent and tucks it in his pocket, dirt, roots, and all. A bevy of twenty-something beauties pout and gossip over double soy non-fat dinner drivel. Fifteen-year-old Snow White look-a-like left the dwarfs at home and brought her entourage. Hurley and Jack Black’s love child sits on a brown suitcase wearing sneakers without socks and rocking a narwhal t-shirt. Leopard-print head-banded brunette clutches her designer bag and wonders why her friends brought her here. Her cell phone is perched in hand, ready to dial M for Mayday. A beat-box rappin’ hipster wears a mini velvet fedora and a three inch tiny tie. At the mike is a cute blond with a flower barrette, sings like a sweet country Fiona Apple. Stylin’ New York Nancy stirs her drink, she’s super cool and put together with her silver hoops and sideways smile. At the counter is tweaker chick and her road rage boyfriend. Navy blue suspenders hold up the pants of an old Chinese guru, hiding out under matching blue beanie. The coffee whisperer checks the grinder and stands watch, face stern as he guards the beans. Pompom tassels bounce on the purse of the type of woman who keeps your local yarn store in business. Fifty-year-old mannish-Marilyn in stripped carpenter chords struts past, her hot pink bra strap peeks out from under her scalloped tee. Clean cut college freshman does a double take as plane Jane transforms into a guitar goddess. Long haired fisherman type surprises the crowd with a classical creation on a bowed psaltery, an odd stringed instrument that he quickly informs us all is part of the piano family. A blue jelly-bean of a man rocks out on his bongos and smiles happily behind horn rimmed glasses. In short shorts and white Keds, the nineteen year old stringy blond in front of me bats her eyelashes at the friend she doesn’t realize is gay. It was quite a night! Feel free to share some of your fun character descriptions in the comments! Happy writing. 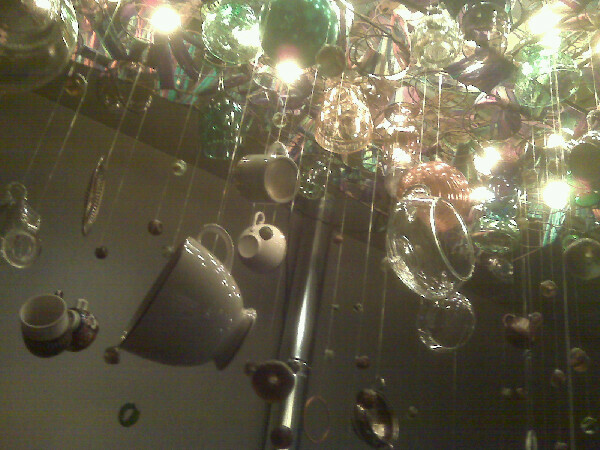 This rockin' cup chandelier was at Jones'. 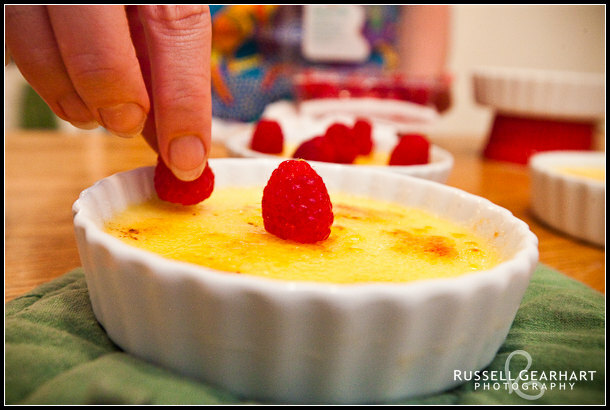 Writing Prompt: Free Write for 20 Minutes (or more) About Creme Brulee. I pull out the blow torch and light the match. The flame bursts into a narrow triangle of blue as fire meets gas. 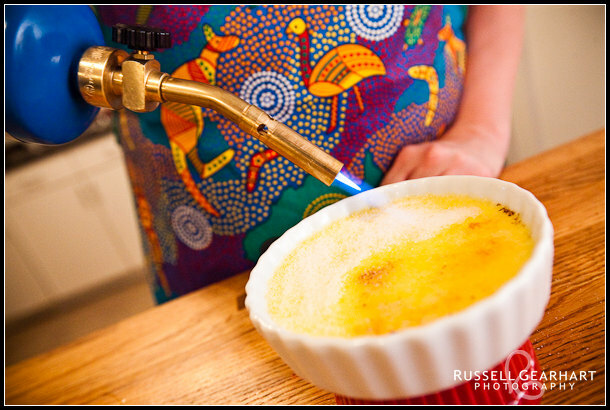 The sugar bubbles with the heat as I lower the flame over the custard. 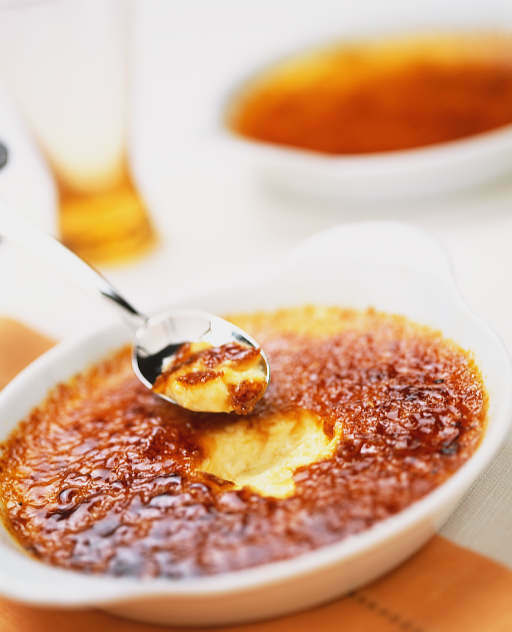 The granules fuse into a perfect brulee, golden like a sheet of marmalade ice. This is my favorite desert to make. It’s my totem. My signature. My best friend, Cherry, nicknamed me Brulee when we first started taking these pastry classes. She said I was hard on the outside, but once you crack my shell I’m a big soft inside. One crack and all the goodness pours right out. 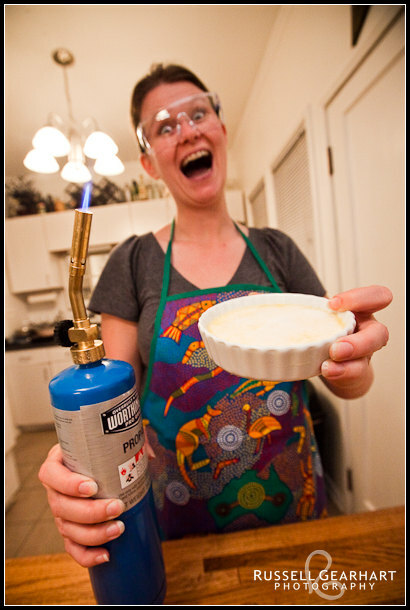 I reminded her that crème brulee should not be runny. It should be firm but light, and chilled to hold its shape. She ignored me. Cherry doesn’t need a nickname. Her parents got it spot on from birth. Cherry’s the maraschino kind, not sour. She’s doused in syrup and so damn sweet you almost can’t stand it. But who doesn’t want a cherry on top? 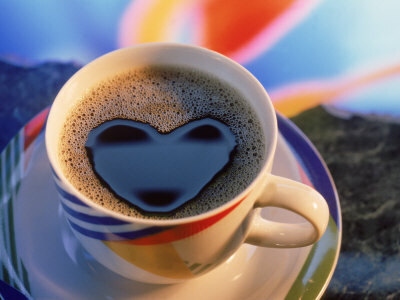 We all need a little sweet. Even a hard-candy Brulee like myself would spoil without her. Our pastry teacher scowls at my hardware-store grade torch. She’s wishing I’d bought the hundred dollar diva-size mini-torches she’d recommended. But I prefer Home Depot to any Kitchen Couture boutique she’s got stock in. One look at my perfectly glazed custard and she’s got nothin’ to say anyway. It’s not the hardware that matters, it’s the technique. And my brulee is flawless. She waddles past my oven, tucking her blouse into her skirt and showing off what the style magazines would call a muffin top. It’s when someone stuffs themselves into too tight pants and their belly runneth-over. The pencil skirt she wears is almost too perfect. It circles her thighs like a paper pastry wrapper that can’t quite hold the hearty helping of batter above. Maybe it’s appropriate, she being a pastry chef and all. You are what you eat. Cherry’s dessert is burning. I smell the sweet evaporating to cinders before the black streak sears her orange cream. “Poppycock!” she exclaims, tossing the ramekin on the table and taming her torch. Cherry’s face flushes at my suggestion. “Not everyone’s a pastry princess!” she snaps. She turns away from me and takes breath, shaking her hands out like a wet dog. When she faces me again her cherry-red smile is back and apologizing. It’s true. Ever since I picked up a whisk I knew the exact amount of rotations to puff up a perfect meringue. I don’t even have to think about it. It’s like I have syrup in my veins and frosting on the brain. I can pour a perfect cup of flour by weight, and smell when the milk’s gone sour before opening the refrigerator. I’m sugar and spice and everything nice, with the ruby red hair and nutmeg crème skin to match. I’m baker’s fire. I’m Brulee. Summer’s coming, is your bikini body ready? Should I be exercising the literary muscle a little bit more? Am I going to wake up one day middle aged and with flabby sentences? 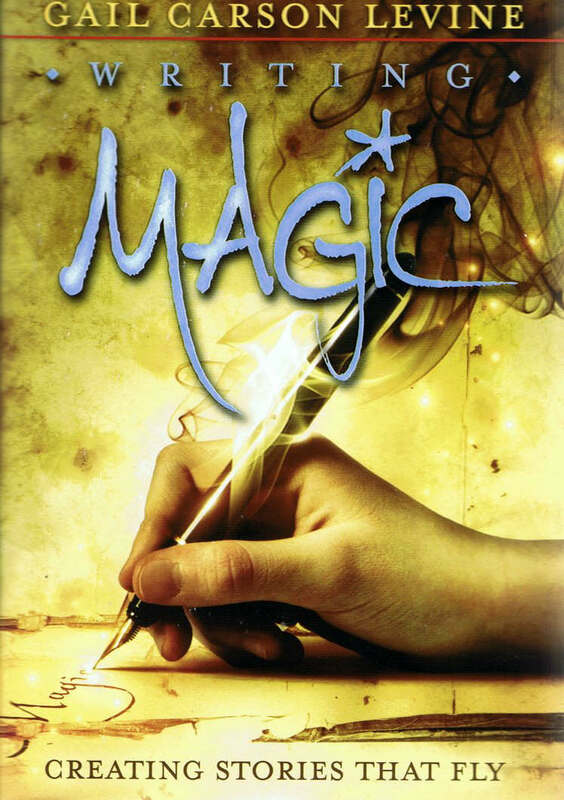 Coincidentally, I just started reading Gail Carson Levine’s book Writing Magic. It seems Levine’s decided to become my literary personal trainer, because each chapter is filled with writing prompts and exercises to get the heart pumpin’ and the creative juices ready for swimsuit season! So what the heck, an exercise here or there can only help! So I’m going to attempt to post one writing exercise a week here on the blog, and I encourage everyone else to get back into shape with me! Write for at least twenty minutes starting with the following sentence: I have one green eye and one brown eye. 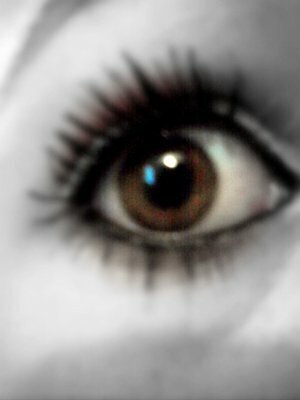 The green eye sees truth, but the brown eye sees much, much more. I have one green eye and one brown eye. The green eye sees truth, but the brown eye sees much, much more. When my baby sister Madeline ran up to me with her legs covered in mud, and tears coating her cheeks, I thought it was just another Sunday morning. I’d clean her up, tell her to leave the Bora twins alone, and wipe away her tears with a cookie. What I didn’t expect was the light. Like a firecracker exploding, a ribbon of sunlight carved its way out of Madeline’s forehead. My whole body seized because I thought she’d been shot. But when she held her dirty palms up to me the light shot out of her fingertips as well, and I knew something was amiss. The light was coming from everywhere, emanating out of her like a burst of starlight. And yet, she didn’t seem to notice at all. She complained that the Bora twins had deliberately tripped her and ruined her good-day shoes. She didn’t see the sparkles that dripped from her lips as she spoke. She didn’t see the silver glow that haloed her hair. I closed my green eye, the one that sees the truth, and she grew even brighter. I closed the brown eye and the light disappeared, like a shut window. That’s when I knew. My father had warned me about the sight. He’d warned me that if I ever saw the signs that I should tell him right away. But I didn’t want to tell him. I looked to the end of the porch where my older sister Emily sat hunched in a rocking chair, knitting. She was not the first in our family to have the sight, but she was the most recent to tell father about it. She looked up and smiled weakly at me and Madeline. Emily used to be beautiful, but now her face is half-hidden behind a patch of black cloth. She had been an obedient daughter. She’d told father about the sight, at first sign, just as he had asked her to do. And the next day the doctors came to our hut with their knives and bottles of gin. Father had the doctors remove the eye. He had them cut it right out.